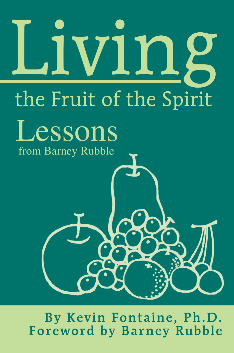 In his Living the Fruit of the Spirit: Lessons from Barney Rubble, Christian writer and Psychologist Dr. Kevin Fontaine demonstrates that Barney Rubble is an excellent role model of how to live a happy, Spirit-Filled Life and shows the reader how we, too, can benefit from the lessons offered by this fine example of a joyful and virtuous existence. The core of the book involves the 9 spiritual gifts as described by Saint Paul: love, joy, peace, patience, kindness, goodness, faithfulness, gentleness, and self-control. The book goes on to give some insights into the nature of the Holy Spirit, how He enters our lives, and how that experience can change us for the better. Dr. Fontaine also dissects each of the 9 Fruits of the Spirit and illustrates how they are exemplified in Barneys attitude and behavior. Using personal anecdotes and examples from specific Flintstones episodes, Dr. Fontaine makes a strong case that Barney Rubble is a fine example to emulate as we all try to become better people and secure for ourselves the type of life we want; one filled with joy, peace, and contentment. Disclaimer: Living the Fruit of the Spirit: Lessons from Barney Rubble was not prepared, approved, licensed, or endorsed by any entity involved in creating, producing, or marketing the character of Barney Rubble or the Flintstones Cartoon Series.